I’ve been trying to rack my brain about how to say “thank you” to a friend of mine. She’s so sweet and always just full of awesome friendiness, but I couldn’t think of the right thing. And then it hit me–she loves chocolate and vanilla and I could totally make her a batch of Cookies and Cream Pinwheel Cookies. I mean, who doesn’t love a big cookie all filled with chocolatey-vanillaey goodness? My friend will so love this. And I’ll have said “thank you” in a totally shareable way. And, because they’re egg-free, she can totally share them with me. Win-win-win-win-win. Heh. Mix dry ingredients, except sugar and chocolate, together in a medium bowl. Set aside. Cream coconut oil and sugar together in a second medium bowl. Add 1/2 of the vanilla, all of the vinegar and 3/4 of the apple sauce to the sugar mixture and blend well. Add dry ingredients into the wet mixture in 1/2 cup increments. Separate half of the dough into a second bowl. In a smaller bowl, place the chocolate and microwave in 10-second increments, stirring every 10 seconds, until the chocolate is completely melted. Mix the chocolate into one of the bowls of dough, stirring until the chocolate is mixed thoroughly into the dough. Mix the remaining 1/2 of the vanilla and 1/4 of the apple sauce into the dough without the chocolate, stirring until the vanilla and apple sauce are mixed thoroughly into the dough. On a large piece of wax paper, turn-out the vanilla dough. Roll the vanilla dough into a large rectangle shape, approximately 1/4-inch thick. On a second piece of wax paper, turn-out the chocolate dough. Roll the chocolate dough into a large rectangle shape, approximately 1/4-inch thick. 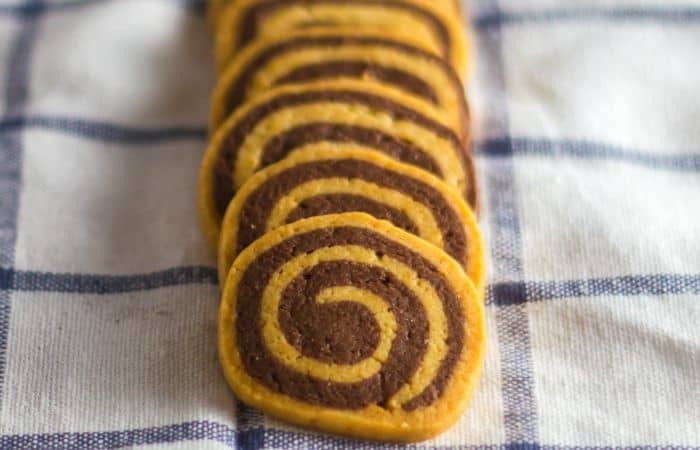 Lay the chocolate dough on top of the vanilla dough and, using your roller, go over the layers of dough a couple of times, just to affix them together–not really to thin them any. 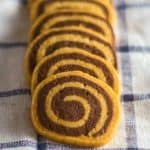 Using a sharp, un-serrated knife, slice the rolled dough into 1/4-inch cookies. Place on a greased cookie sheet about an inch apart (they won’t swell much in the oven). Place in the oven and bake for 8-10 minutes or until golden-brown on the edges. Approximately 2 minutes before the cookies are done, turn the oven down to 300-degrees. 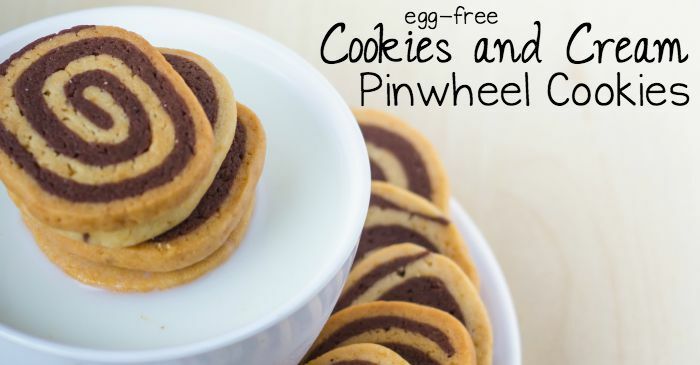 Cookies and Cream Pinwheel Cookies. I mean, who doesn't love a big cookie all filled with chocolatey-vanillaey goodness?